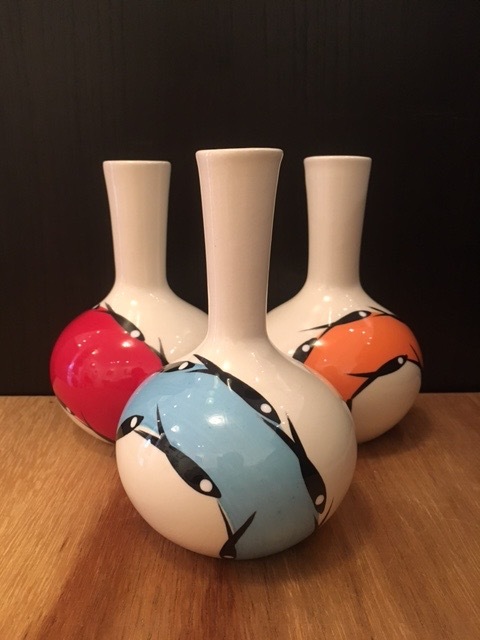 Jobi™ Pottery is a Cape Cod cottage industry that began in 1953 by original owners Joe Colliano and Bill Hastings (“Jo-bi”). When the Cape Cod National Seashore was created in the late 1960s, the Jobis moved their shop to North Truro and eventually sold the business to Lee and Elizabeth Locke, who ran Truro Crafters until it closed in 2002. Today, owner/designer Susan Kurtzman still uses the original mid-century casting molds to create Jobi Pottery in her Truro studio. business, and is “Made in America” by local Cape Codders. Hand painted ceramic mug, multifish pattern, 2 3/4" x 2 3/4" x 3 1/2"
Hand painted ceramic mug, traditional pattern in blue, 4 1/2" x 3 1/2" x 5 1/4"
Piece may vary slightly from online image. 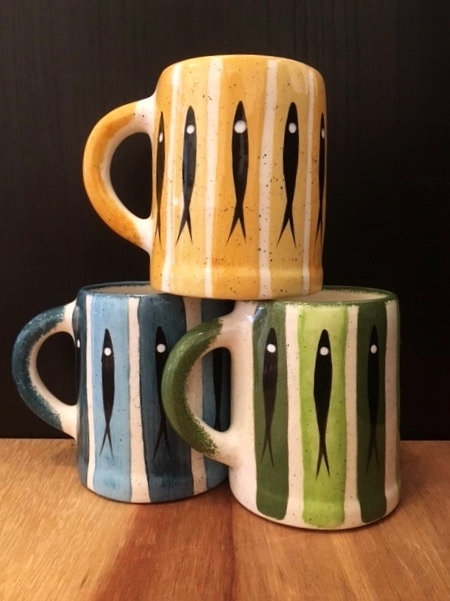 Hand painted ceramic mug, fish and anchor design, 4 1/2" x 3 1/2" x 5 1/4"
Hand painted ceramic mug, green traditional design, 4 1/2" x 3 1/2" x 5 1/4"
Hand painted ceramic mug, blue traditional design, 4 1/2" x 3 1/2" x 5 1/4"
Hand painted ceramic, yellow traditional design, 4 1/2" x 3 1/2" x 5 1/4"
More colors available in the gallery.